The concepts of Human Generated Environment and local interactive spaces may seem quite ambiguous today because it is not yet easy to predict how they will evolve. It is clear, however, that local informational and interactive spaces will revolutionize the reality within the next decade, similarly to how the World Wide Web did it in the 90s. It’s still early days indeed, but we already have some ideas. The lights spheres are freely floating inside the space. Each of them knows about the other spheres and chooses the color according to a selected algorithm. The behavior of the sphere is controlled by a local Interplay Medium microserver. Each light sphere is equipped with a wireless resonant charging unit. The projection screen and other appliances are controlled via a wireless interface by an Interplay Medium microserver. Static light sources (also controlled by an IM microserver) can monitor the presence and behavior of users – both directly and via separate sensors that are embedded into the furniture and other elements of the interior. Decorative interactive elements can be color-based and kinetic. In this example, shelf LEDs play rhythmic patterns; the color and character of light can be selected by the user or according to an algorithm programmed by the designer. In the Interactive space the user controls light intensity from their handheld device. The girl suggests choosing these circles of varying sizes as the window pattern, because they visually rhyme with the shape of the spheres located next to the window. The young man fools around with the color pattern of the shelves. He’s now turning off the chessboard pattern and will instead play Tetris. The cooling fan is connected to the local object network that is managed through a common interface based on an IM microserver platform. 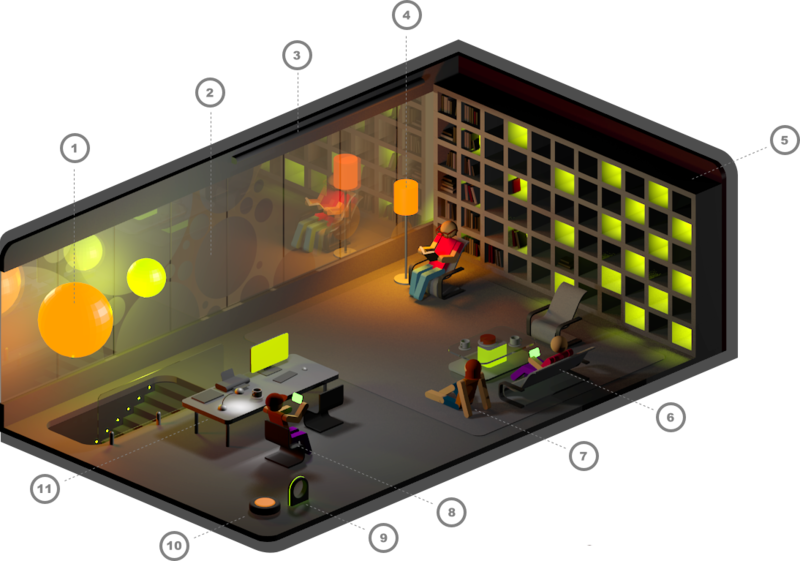 The robotic vacuum cleaner switches on automatically as soon as the Interplay Medium microserver informs it that the whole party has left the room. The coils of a wireless resonant power supply embedded in the tabletop power all the devices located on the table, allowing to get rid of cables. 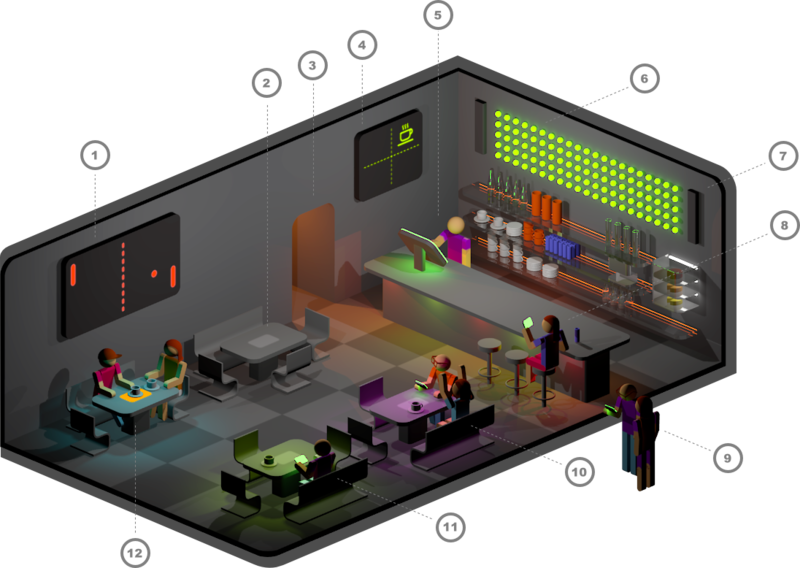 The screen on the wall is used as a board for multiplayer games that are available for customers to play (powered by a local InterplayMedium microserver). The designers of the local interactive space made sure that the look and theme of the games fit to the spirit of the house. Directional light is automatically switched on when guests arrive. The color and intensity of lighting is controlled by an IM microserver that draws information from embedded sensors and can also be adjusted by customers. Orange light indicates that bathroom is occupied. A stylized image that has appeared on the screen above the bar indicates that the corresponding table has ordered a cup of espresso. The bartender can track orders and manage all facilities from his terminal screen. Currently he is putting on the “last orders” message that appears on the panel and will be accompanied by an audible signal. The LED panel shows customer messages as well as announcements from the bartender. The sound system (digital jukebox). The interface is designed to avoid chaotic switching between sound palettes. Customers can choose between music and ambient sounds, select their preferred music genre and even add their own tracks. Friends passing by can see whether there are available tables inside, what genre of music current visitors prefer and even make sure that their favorite cocktail is on the menu; they can do all of it using their own handheld devices and a standard browser. A group of customers enthusiastically play the wall game. …with other guests, passing the time while waiting for their friends. RFID sensors embedded in the desk serve as order trackers. Just put an empty coffee cup in the center of the table and the bartender will know that you would like another one. The LED chat panel on the wall displays messages sent by guests. This is indeed a common online chat, only within a single large space. If the music is too loud and you have lost someone or just want to express yourself, simply type a short message using a browser on your handheld device. Loved the track and want a copy for yourself? No problem! Download the track (or the entire playlist!) from the browser of your handheld device. Some elements of the interior serve a purely decorative function – such as these lights embedded into the steps that change color under your feet. The DJ controls the lighting and kinetic effects on the dance floor. 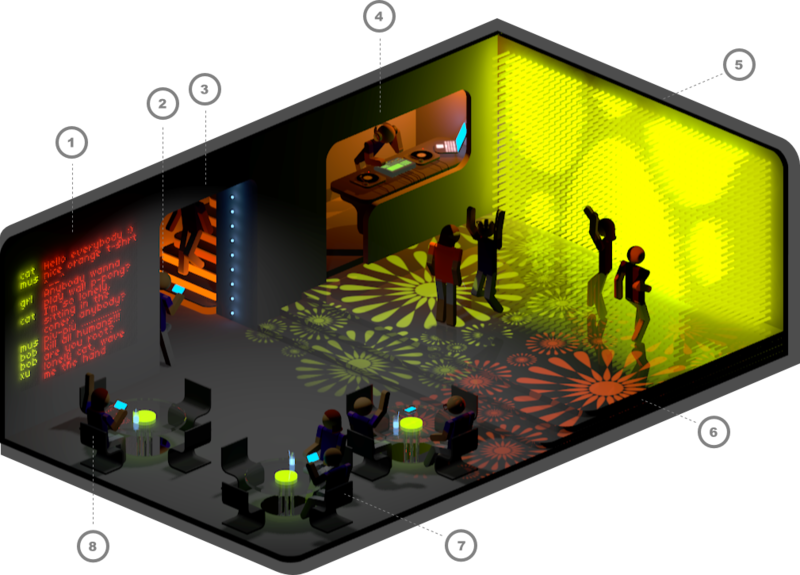 In fact, the dance floor itself also reacts to the clubbers’ mood. The built-in kinetic screen on the wall displays visual effects and even changes its own surface. Visual algorithms can be pre-defined at time of purchase, as well as programmed or controlled in real time by the VJ and guests. …but visual effects are not limited to the screen. Patterns projected on the dance floor can also be either pre-programmed or changed directly during performance. The VJ can use built-in sensors to make the performance even more interactive. Tell the DJ that you are delighted with his mix: Just click the “thanks” button! Designers and architects can use these solution in the buildings and landscapes,by creating more complex interaction logic between architectural objects guided not only by automation but also by considering aesthetic decisions which could be based on interplayed objects of architectural environment.